This is a lovely vegetarian option which makes a wonderful main course for 2 or serves 4 as a light starter. Melt the butter and add in the grated courgette, crushed garlic and dried mixed herbs and sweat gently for 3-4 minutes before adding the breadcrumbs and the seasoning. Mix well and allow to cool down slightly. Peel the mushrooms and place on a flat baking tray. 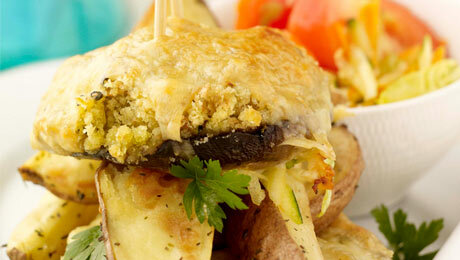 Divide the garlic and courgette stuffing on top of the mushrooms and top with a slice of cheddar cheese. Drizzle with a tiny amount of olive oil. Bake at 180°C/350°F/Gas Mark 4 for 15-20 minutes. Place the potato wedges, olive oil and dried mixed herbs into a large mixing bowl, mix well and then transfer onto a flat baking tray lined with parchment paper. Bake at 180°C/350°F/Gas Mark 4 for 35-40 minutes. Mix together the grated carrot & courgette with the lettuce leaves and tomato wedges. Drizzle with the olive oil, season with a little black pepper and serve immediately with wedges and stuffed mushrooms.